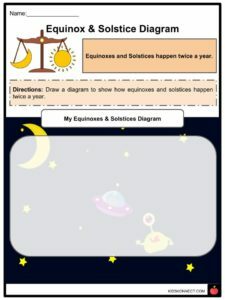 Equinoxes are the moments when the Sun is nearly above the equator twice a year as the Earth orbits the Sun. 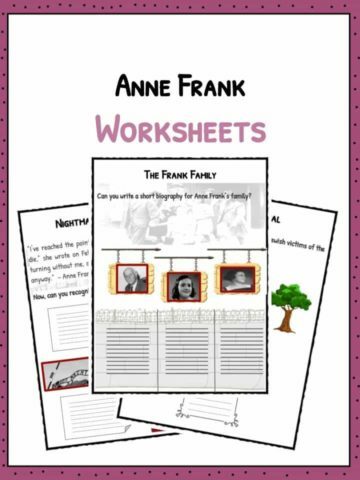 It occurs on March 20 or 21 and September 22 or 23. 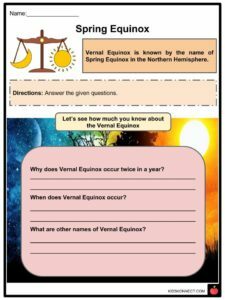 See the fact file below for more information on the Vernal Equinox or alternatively, you can download our 23-page Vernal Equinox worksheet pack to utilise within the classroom or home environment. 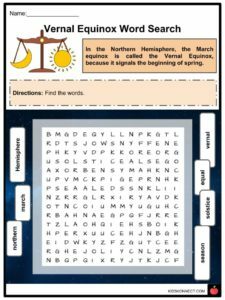 The word Equinox is derived from the Latin words aequus (equal) and nox (night). Equinox means ‘the equality between Day and Night’. 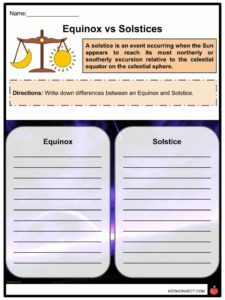 The day and night are said to be equal in length because the Earth’s two hemispheres are receiving equal sun rays at the equinox. 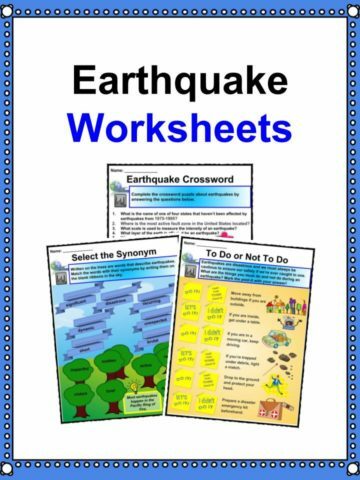 It is brought about by the Earth’s tilt on its axis and continuous movement in its orbit. The Earth-centred view is that the celestial equator (a great circle dividing Earth’s sky into Northern and Southern hemisphere) wraps itself above the equator. Thus the sun enters the northern hemisphere’s sky by crossing the celestial equator during equinox. The Earth-in-space view is that the Earth is tilted by 23 ½ degrees, causing both the hemispheres to share daylight and warmth. 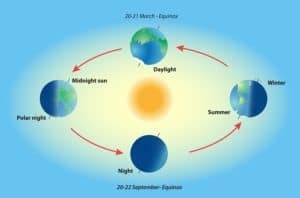 Therefore, there is equinox twice a year when the Earth’s tilt on its axis and Earth’s orbit combine in such a manner that the axis is slanted neither away from nor towards the sun. Vernal means fresh and new like a spring. The Equinox that occurs in March is known as Vernal Equinox in the Northern hemisphere and Autumnal Equinox in the southern hemisphere. In September, it is Vernal Equinox in the southern hemisphere and Autumnal Equinox in the northern hemisphere. It marks the beginning of spring in the northern hemisphere and that of autumn in southern hemisphere, and vice versa in September. The sun rises earlier and dawns later in the northern hemisphere. The days are warmer and the plants begin to blossom, announcing the arrival of spring. The sun rays fall directly on the equator due to the Earth’s tilted position. 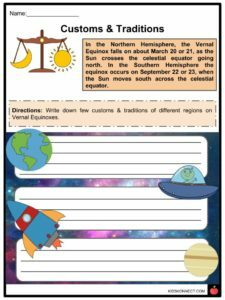 The people standing at the equator will see the sun directly over their heads during equinoxes. Whereas the people at north pole will welcome six months of continuous daylight. At the south pole, people will have to endure the darkness for six months. Vernal Equinox marks the start of a new astrological year. The festival of Easter dependably falls the primary Sunday after the full moon following the vernal equinox. Nauroz, the Persian New Year is celebrated for 13 days, with the main day of festivity following on the vernal equinox. Japan praises the arrival of spring, following the vernal equinox with the Cherry Blossom Forecast. The Great Sphinx built by the ancient Egyptians was used to indicate the rising sun on the vernal equinox. The celebrations of Holi begin on the vernal equinox. It is an ancient Hindu festival celebrated in India and Nepal. The point where the Sun crosses the equator northwards is known as the First Point of Aries. In any case, because of the precession of the equinoxes, this point is no longer in the group of stars Aries, but instead in Pisces. In 2600, it will be in Aquarius. In light of the modern constellation limits, the northward equinox went from Taurus and Aries in the year −1865 (1866 BC), went into Pisces in the year −67 (68 BC), will go into Aquarius in the year 2597, and will go into Capricornus in the year 4312. The Babylonian calendar started with the primary full moon after the vernal equinox, the day after the Sumerian goddess Inanna’s arrival from the underworld (later known as Ishtar). The Persian calendar starts at the vernal equinox every year. 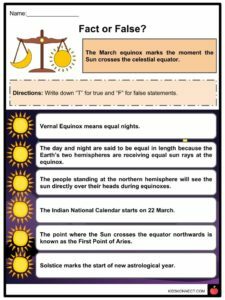 The Indian National Calendar starts from the day after the vernal equinox. 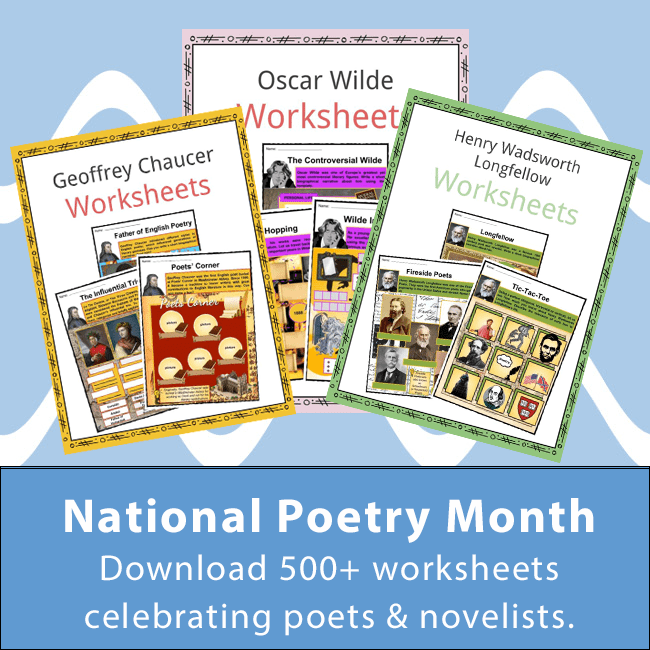 The Julian calendar change stretched for seven months and supplanted the intercalary month with an intercalary day to be added every four years to February. This had the impact of including around seventy-five percent of an hour like clockwork. The impact gathered from initiation in 45 BC until the sixteenth century, when the northern vernal equinox fell on 10 or 11 March. 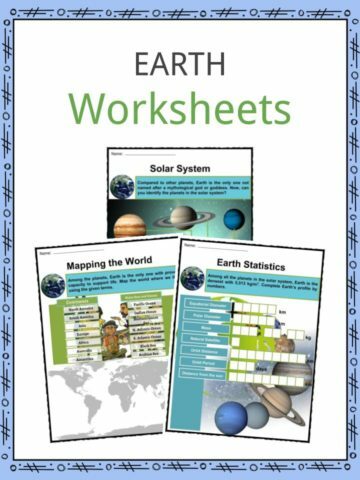 This is a fantastic bundle which includes everything you need to know about Vernal Equinox across 23 in-depth pages. 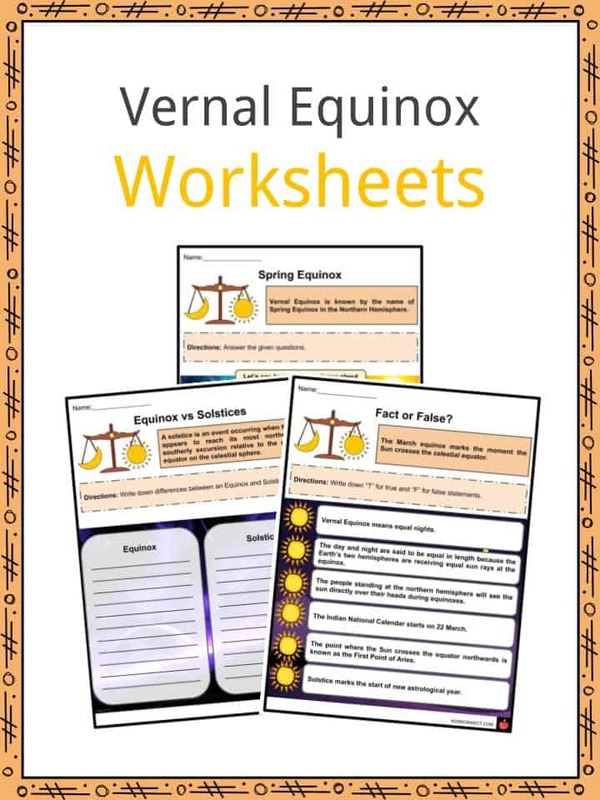 These are ready-to-use Vernal Equinox worksheets that are perfect for teaching students about the equinoxes which are the moments when the Sun is nearly above the equator twice a year as the Earth orbits the Sun. It occurs on March 20 or 21 and September 22 or 23.